I’ve always been a fan of efficiency. I love shortcuts and culinary shortcuts are no different. Watching some video about ramen I thought I understood what I was seeing. With that mindset you will have brown broth that is salted and some mushy yellow noodles that look like ramen but do not come close to the real experience of it. 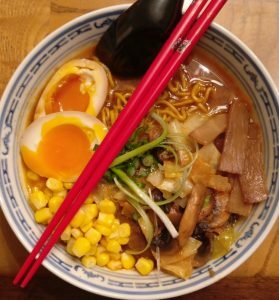 My ramen journey is full of times when I thought I was a better cook than I was, when I thought I had a better idea than I had, and better results than they were. I’m guessing that’s all part of it. Ramen in most households is a catch all for leftovers and my house is no different. Japanese style nabe hotpots find their contents in the next day’s ramen bowl. The results are less than spectacular, so I’m doubting you will see these ugly bowls too often.